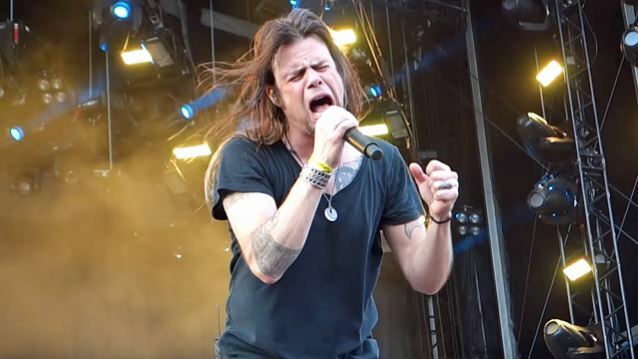 Eclectic Arts conducted an interview with QUEENSRŸCHE singer Todd La Torre before the band's March 19 concert at the Snoqualmie Casino Ballroom in Snoqualmie, Washington. You can now watch the chat below. A couple of excerpts follow (transcribed by BLABBERMOUTH.NET). Todd: "The glory days where you could take an entire year off and write and record, and you could earn a good, substantial living off of publishing, those days are gone. And so, you can still earn decent money… not like that. You're not selling millions of albums. Nobody's going gold unless you're a pop star. And so we have to try to find the writing and recording in between when we're touring. And, unfortunately, it becomes this cycle of… I think we'll probably do a record every two years, because by the time you try to promote and tour on it, there just isn't that ample time to take a year off and write and record. So it's kind of a two-year cycle, I think, for us, and for a lot of bands. I've been able to put out two albums with QUEENSRŸCHE, and they've been very well received, and so certainly we're very proud of that. We're already writing and getting some ideas started for the next record, and hopefully we'll be able to start tracking by the beginning of next year and see what that brings. But for now, we're only into March, and we've got the whole year to still incorporate newer stuff from the album, which we're excited to do that. It's just very hard to find time when you can rehearse when you're playing all the time, and then when you go home for a week, or two weeks, we have to have a personal life too. And so we hope that people understand that. You are working for them, but we have to also try to find time for our families and our own personal things too. But otherwise, we feel confident about what we're doing, and it's going well." Todd: "I don't have formal training, if you will. I've just always enjoyed singing and taught myself what I know. I have been to some vocal coaches to evaluate what I'm doing right, what I'm doing maybe incorrectly or what I can improve on, and I've taken those to heart. And I do work on things at home with trying to keep my range up. And I know where my weaknesses are, so I do practice at home to try to work on things that I know need working on. As far as warming up, I don't really do much. I know great singers that spend hours doing lip rolls and all these little scales forever, and then I know other great singers that do nothing — literally nothing. And usually, for me, I'll spend five or ten minutes before a show, and then I just go on stage. I eat what I want. I don't drink alcohol, but if wanna drink a coffee or a Coke, I drink a Coke. I don't worry about the 'rules.' I know a lot of great singers that have, in my opinion, kind of fallen prey to the rules, where it's in their head that they can't eat this or they can't drink something that's not room temperature. And everyone has their own little quirky things. I've been doing this way before the world knew who I was or anybody remotely knowing that I could sing at all. I've been doing this for most of my life, so I just know what works for my body. I've tried to do everything by the book and had a mediocre performance. And then I've done everything wrong and had the best performance of my life. So there was never a benchmark or a regimen that went, 'Okay, that works every time.' It doesn't work like that for me. And I've heard and spoken with many great singers — some of the world's best singers in this genre — that don't do anything. And then I've met others that do weird, crazy things, and that works for them. But a lot of the time, if you get down to it, it's psychological. I mean, I'm not saying that practicing is bad — it's not bad — but you can overdo it. And I like to save what I have for getting out there. And, you know, I'm just a human being. There are so many variables that the average person that doesn't sing for a living just doesn't… they probably don't quite understand. And it's all of the physical things that happen to you with touring and [air conditioner] pumping ridiculously in buildings and meet-and-greets and talking and all of those kinds of things that do fatigue your voice. But I do a lot of screams and different vocal exercises at home to try to improve on weaknesses. But overall, warming up before I go on, I do it more as an assessment, to see where I am. Maybe I wanna approach something a little differently if I'm not feeling quite as strong that day. But I've had people that are peers that I admire immensely that have given me really wonderful compliments on my technique. And Myles Kennedy [ALTER BRIDGE] is one; he was very complimentary to what I'm doing. James LaBrie [DREAM THEATER] I've had many conversations with; he's been very complimentary as regarding my technique. So, from a technical standpoint, I feel pretty confident. But I am singing a very demanding, challenging vocal style, and so I just do the best that I can each night. And you're gonna have some off nights and you're gonna have some great nights. But I feel like I'm fairly consistent." QUEENSRŸCHE hired Todd La Torre to replace Geoff Tate in 2012 and has released two albums with the ex-CRIMSON GLORY frontman: 2013's "Queensrÿche" and 2015's "Condition Hüman".